Community Input - 5th Ave Development Project - Naperville, IL - Ryan Co. Throughout this process we’ve gained invaluable input from residents, commuters and community stakeholders in order to identify and prioritize key concerns so we may create a vision and concept that will enhance this community for years to come. Over the last several months there have been numerous opportunities to express thoughts or share ideas through community meetings, taking a survey or participating in a Working Group or on the Steering Committee. As we move into the concept phase of this process we are continuing to provide the members of this community with frequent opportunities to share their opinions. Visit the events tab for a full list of upcoming public meetings and as always we welcome you to email 5thAveDev@RyanCompanies.com. Connecting with and gaining broader community feedback is a critical component of this process. Numerous community meetings have been held to date and we will continue to provide this opportunity as we move forward into the concept phase. We encourage you to attend to learn more and provide your support and/or ideas for the proposed concept. For more information visit the concept tab. 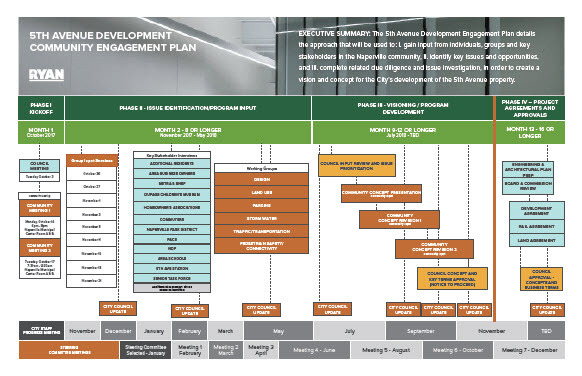 The purpose of the Steering Committee is to provide Ryan Companies with community input and direction during the engagement/program phase of the development process. The Steering Committee’s role will continue through the concept/program development phase. The Steering Committee chose to move forward with the following Working Groups: land use, storm water, pedestrian safety/connectivity, traffic/transportation, parking and design. Each group consists of 4-5 community representatives, a City Council member, city staff, and representatives of Ryan Companies. Over the course of several weeks the groups developed a cohesive set of concept principles which are being used as the guide during the concept development phase. Click here to review the Working Group Activity Matrix.The Combined Working Group Report along with the June 4 Combined Working Group Meeting Summary and submitted questions are now available. The 5th Avenue Development Land Use & Height Survey is now closed. Survey results are posted here. Click here for more information on the survey process. The Group Input phase of the process is now complete. Over 160 residents, commuters and business owners joined us across the nine sessions to share their ideas and feedback for the space.